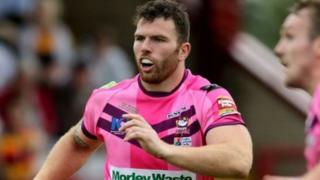 Batley Bulldogs have banned a fan for sending homophobic tweets to club captain Keegan Hirst and his friend, Coronation Street actor Anthony Cotton. Hirst, 27, became the first British rugby league player to come out as gay while still playing professionally when he made the announcement last month. Naming fan Jordan Coyle on its website, the club said he would no longer be allowed in the Fox's Biscuits Stadium. "There is no place in our sport for homophobic abuse," it said. "Since Keegan publicly confirmed his sexual orientation we have been delighted by the response and support he has been given by everybody at the club and indeed throughout our sport," it said. "This is the first and hopefully the last time we witness such unpleasantness." The statement added: "We wish to send out a clear message that if you engage in such behaviour we do not want you to attend our stadium." Mr Coyle has been contacted for a comment.